Help Jake and Izzy find the gold doubloon on Never Land Island! Give them the pixie dust so they can fly around the island and spot the treasure hiding behind the bridge. Put it safely in the Team Treasure Chest and draw up the bridge to make sure no one else can get to it, then have fun on the slide that goes straight into the sea! 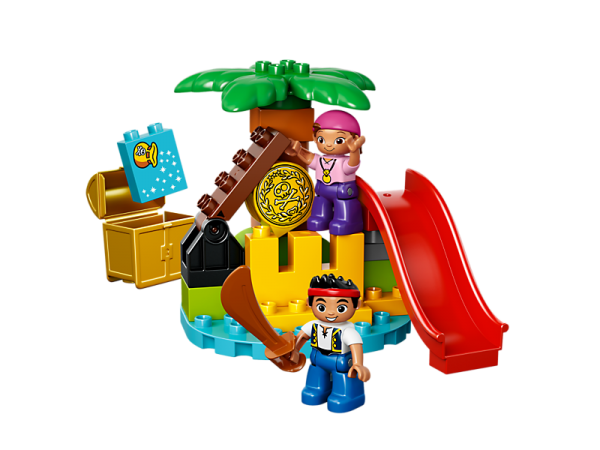 Build and rebuild the island for endless adventures with this LEGO® DUPLO® brand Jake and the Never Land Pirates™ set. Includes 2 LEGO® DUPLO® figures: Jake and Izzy. Playall day with Jake and Izzy on the turning slide!